You Run It | This is my Turing Machine, run by millions of people & events around me…. So you are one…. Some bird – may be cuckoo. Lonely in the dense and dark. Its dark blue in the east. Another and yet another night. Since last one week, I am on bed, isolated in one room. Neem leaves spread over the bed and I am awaiting for blisters to dry up and back to my health again. I, with two more colleagues got chicken pox at the same time. Not sure if its the temparature humidity controlled AC room and another colleague who have just recovered up or being blessed with the Mata not blessed earlier (Chicken pox is still considered the blessing of Godess in many part of India). Anyway it has to happen! During the course, the fever, headache and the weakest feeling have changed the taste buds too. Earlier days as the mouth was affected, even a bit of salt or slightest spicy food was intolerable. I was given boiled food with little salt and turmeric. I used to have the changed menu even in those days. Though I must admit, the boiled food has been tasty really. Dear used to have the same food, prepared for me. Not sure, how! Note worthy here is we both love spicy food!! Today’s lunch was again simple and again same dull looking because of the little oil and microscopic masala but it was plateful rice, dal with lauki, bottlegourd bhaji, aloo gobhi sabji. After the weakness in this recovery period, I had finished them in a shot and asked for a second little serving!! May be its again one of the tastiest food, I had from her. May be spices that contribute to the taste, but its something else than spices that makes food so tasty! Love you dear !! I used to have little argument with her on the old saying that, the way to men’s heart is not only through stomach but other things too. But I guess there exists ‘a way’, and infact there must be a national highway in construction !! 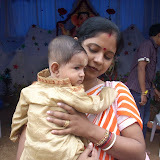 Shubh turned one year on 12 March with a very simple in house ceremony. And the whole year went on with prayers for his well being. Protected or say hidden, loved and cared in the nest for this whole year. Never knew the life changes this way, when there are eyes which talks to you a lot. Everytime I take out laptop, he loves to be around and pull up the keyboard’s keys. Shift key is shifted! Few days back camera lens struck, when he tried to hold the zooms. My gadgets are now on risk zone, as to him all electronic goods look the next toys in hand. Anyway, wishing all the electronic items good luck, let me do some blog writing, keeping shubh nearby. Few days back, he have learned how to cross the main door of house(chaukhat)! Shubh Yatra! God bless you. In a little sea within. The shell – he is today. What an empty house in Diwali is – I could feel yesterday. Before that I could see only the tears – the water drops – in mother’s eyes.